PhDWorks.org: SUPERB Custom Writing Service! FREE Plagiarism Report! We Work for YOU to rest! PhDWorks.org offers one of the best custom writing services you can find on the web. Foreseeing your needs, our custom writing company provides all the types of PhD papers you might search for, thoroughly edited and proofread. Whether it is a PhD level application essay, thesis, coursework or a dissertation, you are getting surprisingly perfect results. Hundreds of students order from us daily! 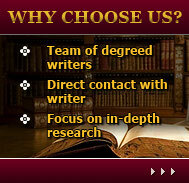 …we are the ONLY custom writing service on the web to give a GUARANTEE that your paper is plagiarism free! We do not offer essays for sale – we offer papers written from scratch, tailored to your specific needs! …we value the time of our clients and know that a paper late by an hour might be absolutely useless for you! Can only PhD level students order from you? Certainly not! Any student, whether College, Master, or PhD, can place an order with us! You need quality custom writing services, right? We are here to give them to you! What if I am not completely satisfied with my assignment? Your paper will be revised as many times as it is needed until you are completely satisfied with the outcomes of our work. I have an essay due in 3 hours. Can you help? Contact us ASAP in this case! We are able to assign your project to several custom writers to work on the spot and have your online essay delivered on time. We have had such cases before. Make the right choice – do not let your work fail!